Mostly tillable. Mostly Contiguous. To be surveyed. Tract 3 - 125 +/- acres (129.0+/- acres) - This tract of land will have road frontage on Levee Road plus an easement for access across tract 2. The property is approximately 120 acres tillable. Soil types indicate 114.5 PI There are a couple of wet spots on this tract that could make for some good waterfowl hunting. Tract 4 - 44 +/- acres (47.3+/- acres) - Mostly tillable, soil types indicate 112.7 PI. Road frontage on Levee Rd. 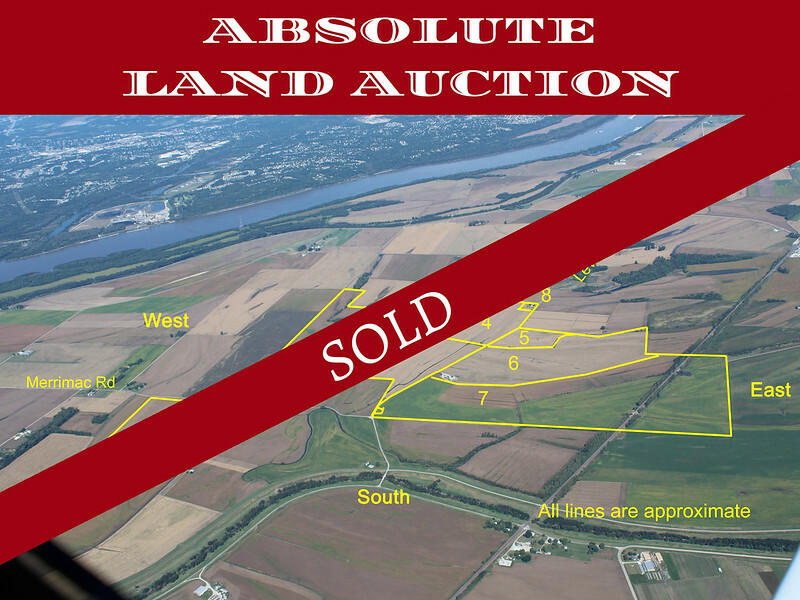 Tract 6 - 114 +/- acres (115.0+/- acres) - 112 +/- tillable acres with frontage on Levee Rd. Soil types indicate a 111.4 PI This tract of land has the approximately 80,000 bushels of bin storage and 2 older buildings. Tract 7 - 215 +/- acres (200.7+/- acres) - 200+/- tillable acres with frontage on Levee Road (The county owns an acre that the land owner can rent from the county to farm.) Soil types indicate 103 PI. Part of this farm is across the ditch, a new concrete culvert was recently installed by the railroad. Access to the ground on the east side of the railroad is over the tracks. Access road is owned and has been recently rocked. An easement has been granted to the property to the south. Tract 8 - Home & 5 +/- Acres (No change in acreage)- This 3 bedroom home on 5 acres would make a great home or an investment. While it needs some work, the home has potential to be a 4-5 bedroom home with 2 bathrooms. New aeration system installed 2 years ago, well was 3 years ago. NOTE - Tract 8 cannot be combined with any other tract as the sellers are not the same. FSA Information: According to FSA maps it show 677.32 tillable acres on this farm. Agent Comments - Excellent farm investment. It is not often this amount of land can be purchase all in one place. It took Clem many years to put it all together. Earnest Money: Within 24 hours of close of bidding, the approved high bidder will deposit a non-refundable payment of 10% down - deposited with Mon-Clair Title Company. Any stop payment order of a check, or giving a check, which is returned marked “insufficient funds,” shall be deemed by the parties to be evidence of fraud existing at the time the transaction was consummated and shall be construed by the parties as intent to defraud. Closing: On or before December 21, 2018. Farm Lease: Subject to current farm lease. 1/3 - 2/3 on the winter wheat & fertilizer. DISCLAIMER AND ABSENCE OF WARRANTIES: Subject to prior sale. Subject to all easements, covenants, and restrictions on record. All information contained herein, and all related materials are subject to the terms and conditions outlined in the agreement to purchase. The property is being sold on an “AS IS, WHERE IS” basis, and no warranty or representation, either expressed or implied, concerning the property is made by the Seller(s) or the auction company. Each potential bidder is responsible for conducting his or her independent inspections, investigations, inquiries and due diligence concerning the property. The figures, estimates, and drawings of acreages and boundary lines in the printed material or on the website are approximate and are not guaranteed. The information provided here is believed to be accurate but is subject to verification by all parties relying on it. The Seller(s) or the auction company or their agents assume no liability for its accuracy, errors or omissions. It is the responsibility of each bidder to make sure that the Auctioneer is aware of his or her intent to place a bid. Auctioneer disclaims any liability for damages, whether direct, indirect, consequential, or incidental, resulting from bids not spotted, executed, or accepted. Bidders should also be careful to bid on the correct item and ensure that his/her bid is for the amount intended. Auctioneer is not responsible for errors in bidding, and Buyer hereby releases the Auctioneer and waives any claims for bidding errors. The sale is complete when the Auctioneer so announces in a customary manner. The auctioneer is not responsible for errors in the internet connection or the functioning of the computer system at that time. Conduct at the auction and increments of bidding are at the direction and discretion of the Auctioneer. The seller and auction company reserve the right to disqualify or refuse any bid from the person if there is any question as to the person’s credentials, fitness, etc. All decisions of the Auctioneer are final, and all announcements made the day of the sale by the Auctioneer will take precedence over printed or spoken information made prior. Auctioneer has the right to cancel the sale. Property Peddler Inc. and their agents work for the Seller.